Very unusual traction for the Dawlish sea wall! 58021 Hither Green Depot passes underneath the distinctive red sandstone cliffs, as it approaches Dawlish on 29 June 2002 with the Pathfinder Tours 1Z58 05:30 Birmingham New Street to Penzance 'Cornish Explorer'. 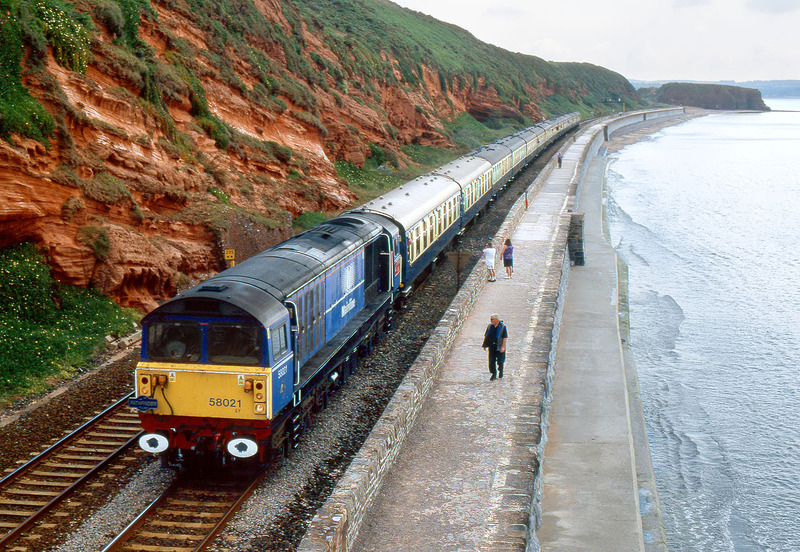 Class 58s in Devon are rare enough, but this was the only occasion that a one worked a railtour to Cornwall. It was evidently all too much for 58021, as due to an electrical fault, the return journey was made behind 47811 to Plymouth, and then 47737 onwards, with 58021 dead in tow.